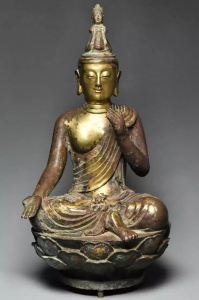 HOUSTON, TEXAS, USA, October 12, 2018 /EINPresswire.com/ — Rivertown Antiques & Estate Services, one of the world’s most trusted sources of Asian fine and decorative art, will present a 188-lot auction on Saturday, October 13 featuring rarities whose timeline runs from the Shang Dynasty (2nd millennium BC) through the 20th century. 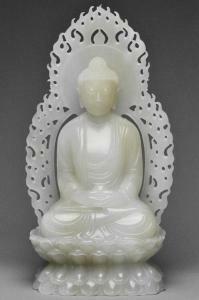 Absentee and Internet live bidding is available through LiveAuctioneers. The fully curated connoisseur’s selection includes distinguished estate and family items from the United States, Great Britain and Continental Europe. They include the Charles George collection, property from the collections of Mr. and Mrs. Edward Johnson, Samuel E. Wilson, Robert Edwards; and a former Beverly Hills, California, private collection. A star lot among the many bronzes in the sale is a 13th/14th-century silver-inlaid figure of Avalokiteshvara. This remarkable treasure was acquired in China in the 1920s by Samuel E. Wilson (1891-1965), who, at the time was working there as a journalist. Reflecting superlative artistry, it stands 15½ inches high and shows no signs of repair or restoration. The pre-sale estimate is $2,000-$2,500. Another top prize from the Wilson collection is a Western Zhou Dynasty bronze yu, or ritual vessel, with an intriguing design that blends perfect symmetry with time-honored craftsmanship. There are no repairs, and its unrestored beauty is enhanced by natural verdigris. Estimate: $6,000-$8,000. A second ritual food vessel from the Wilson collection is known as a “ding.” This ancient bronze dates to the Shang Dynasty (circa 1600-1046 BC) and is expected to make $4,000-$5,000 at auction. Standing 19 inches tall, a Tang Dynasty gilt bronze figure of Guanyin was previously held in the collection of Robert Edwards (1883-1979) and his wife Gloria (1886-1960). Mr. Edwards arrived in Shanghai in 1910 to work for Jardine, Matheson & Co. The couple, who married in 1917, collected Chinese antiques until they return to Britain in 1938/’39. The Guanyin figure passed by descent through the Edwards family and will be offered at auction with a $10,000-$12,000 estimate. Also carrying provenance from the Edwards collection is a 9¾-inch Song Dynasty Qingbai Boys Meiping vase with stand, estimated at $4,000-$5,000. 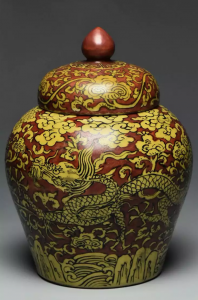 An exceptional example of Ming Dynasty ceramic artistry, a 7¼-inch enameled dragon jar is richly decorated in iron red on a yellow ground and bears the Jiajing Mark and Period. The vessel was previously held in the Beverly Hills, California collection of a connoisseur who regularly purchased Asian antiques from London and New York dealers during the 1970s and ’80s. A stunning example, is estimated at $6,000-$8,000. Yet another flawless ceramic, a 9¼-inch Qing Dynasty yellow glazed vase with Kangxi Mark and Period, has provenance from the collection of Mr. and Mrs. Edward Johnson. A career diplomat, Mr. Johnson (1881-1950) spent 20 years in China during the early 20th century. It was there that he and his wife acquired highly important pieces of a type so seldom available to collectors today. The vase is estimated at $6,000-$8,000. Rivertown Antiques & Estate Services’ Saturday, Oct. 13, 2018 no-reserve auction will begin at 9 a.m. Eastern Time, with absentee and Internet live bidding through LiveAuctioneers. For additional information on any lot in the sale, please call 844-273-9740; email contact@rivertownantiquesauctions.com.